There are 15 million members on Match.com and 60,000 join every day. After 6 months, if your ideal match isn’t one of those people, Match.com will offer you an additional 6 months for free. 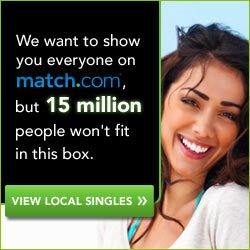 After all, more people find love on Match.com than any other Web site, and that’s a reputation they want to keep. Join today and if you don’t find a Match within 6 months, you can get another 6 months free!